This 3-D airborne light detection and ranging (lidar) oblique view of the Borrego Fault, taken from the post-earthquake topographic survey, shows a wide zone of numerous small faults that slice the ground surface and offset the floor of a desert wash surrounding the main fault. The various colors in the landscape represent elevation changes during the earthquake. Image generated in Crusta (keckcaves.org) with 2x vertical exaggeration. 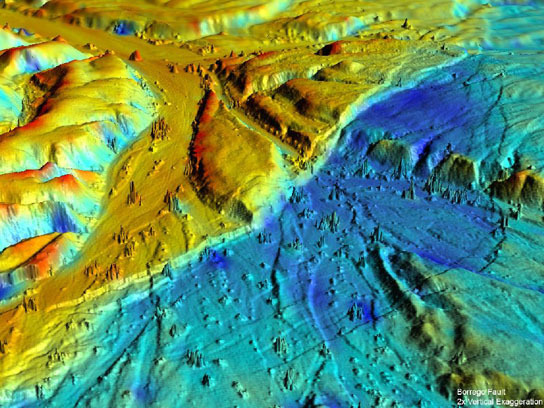 Geologists are using new airborne lidar equipment to study earthquakes and provide comprehensive before-and-after pictures earthquake zones. The lidar (light detection and ranging) equipment can measure features in the surface height to within a few inches by bouncing laser pulses off the ground and measuring their reflection. Geologists have a new tool to study how earthquakes change the landscape, and it’s giving them insight into how earthquake faults behave. In the Feb. 10 issue of the journal Science, a team of scientists from the United States, Mexico and China, including geophysicist Eric Fielding of NASA’s Jet Propulsion Laboratory, Pasadena, Calif., reports the most comprehensive before-and-after picture yet of an earthquake zone, using data from the magnitude 7.2 event that struck near Mexicali, northern Mexico in April 2010. 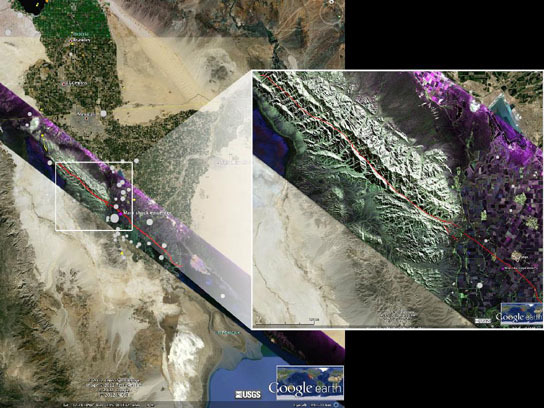 False-color composite polarimetric image over the fault ruptures (red lines) of the April 2010 El Mayor Cucapah earthquake in northern Baja California, acquired Feb. 3, 2012 by NASA’s Uninhabited Aerial Vehicle Synthetic Aperture Radar (UAVSAR), overlaid on a Google Earth map. The U.S.-Mexico border is shown by a yellow line extending horizontally across the upper third of the image. The Gulf of California is in the lower right. Gray circles denote large historical earthquakes, with yellow and orange dots show earthquakes within the last week and day, respectively. In the inset, taken from the central part of the fault rupture, greenish shades are rocks and gravel in the Cucapah Mountains, while purplish tones are smoother soil in the Mexicali valley to the east. This image will be combined with other images of the same area to be acquired during future flights in order to measure the motion of Earth's surface during the time between images using a technique called interferometry. The interferometric measurements will allow scientists to study the pressures building up and being released on faults at depth. The team, working with the National Center for Airborne Laser Mapping, flew over the area with lidar (light detection and ranging), which bounces laser pulses off the ground and measures their reflection to determine the height of the surface. New airborne lidar equipment can measure features in the surface height to within a few inches. The researchers were able to make a detailed scan after the earthquake over about 140 square miles (363 square kilometers) in less than three days, said Michael Oskin, geology professor at the University of California, Davis. He is the lead author of the study, which was funded by the National Science Foundation, the U.S. Geological Survey, Consejo Nacional de Ciencia y Tecnología (Mexico) and NASA. Oskin said that they knew the area had been mapped with lidar in 2006 by the Mexican government. When the earthquake occurred, Oskin and Ramon Arrowsmith at Arizona State University, Tempe, applied for and got funding from the National Science Foundation to carry out an immediate aerial survey of the previously mapped area. 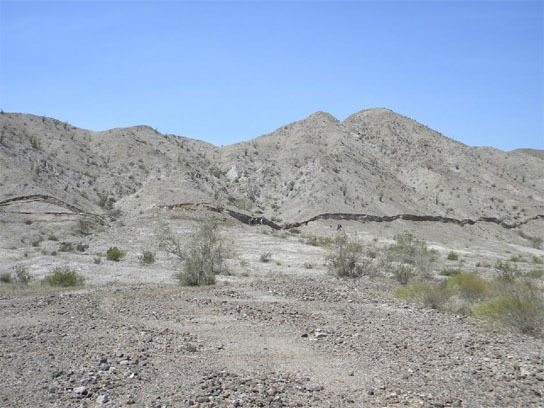 This five-foot-high (1.5-meter-high) surface rupture, called a scarp, formed in just seconds along the Borrego fault during the magnitude 7.2 El Mayor Cucapah earthquake in northern Baja California on April 4, 2010. Topographic surveys of the surrounding landscape reveal the complexity of earthquake deformation, including how this fault interacted with adjacent faults and the surrounding volume of rock. Co-authors John Fletcher and graduate student Orlando Teran from the Centro de Investigación Científica y de Educación Superior de Ensenada (CICESE) carried out a traditional ground survey of the fault rupture, which helped guide planning of the aerial lidar survey and the interpretation of the results. Fielding assisted in planning the lidar survey and in the final interpretation of the lidar measurements of the folding of the rocks near the fault. By comparing pre- and post-earthquake surveys, the team members could see exactly where the ground moved and by how much. The survey revealed deformation around the system of small faults that caused the earthquake and allowed measurements that provide clues to understanding how these multi-fault earthquakes occur. The 2010 Mexicali earthquake did not occur on a major fault, like the San Andreas, but ran through a series of smaller faults in the Earth’s crust. These minor faults are common around major faults but are “underappreciated,” Oskin said. “This sort of earthquake happens out of the blue,” he said. The new lidar survey shows how seven of these small faults came together to cause a major earthquake, Oskin said. Since 2009, JPL has been flying its airborne Uninhabited Aerial Vehicle Synthetic Aperture Radar (UAVSAR) over the California border region to measure ground deformation in the area. UAVSAR, which flies on a NASA Gulfstream III aircraft, uses a different technique — interferometric synthetic aperture radar — to measure ground deformation over large areas to a precision of 0.1 to 0.5 centimeters (0.04 to 0.2 inches). UAVSAR flew repeat GPS-guided passes over the California side of the border region twice in 2009 and six times since the Baja quake, imaging it and its continuing deformation since. Fielding said NASA recently secured approvals from the Mexican government and began flying UAVSAR south of the California border over the Baja California earthquake zone in February 2012. These flights will be conducted every three months to monitor fault movements. 1 Comment on "Lidar Equipment Provides Comprehensive Pictures Earthquake Zones"
It’s really very important information on LIDAR, Thank you so much for your valuable time to write this important information for us.